With a boom in the number of baby boys being born this year, it is about time to let you in on some different and funky options for boys other than cutesy baby blue with caterpillars. Both these labels are Australian, well priced and worth checking out their websites to get a better idea of their full range and styles. I hope you love them as much as I do! Munster have filled that awkward gap of dressing boys up to 14 years of age in fun clothing that they actually want to wear. Think whimsical, neater skater style, skinny jeans, simple cuts and fun prints. I love giving the Mini Munster as gifts because a lot of people aren’t aware that fun baby clothes exist for boys. The range seems to sell fairly quickly as people are catching on to this funky brand so it may be worth checking out where Munster is stocked. Keep up to date by following them on Instagram- search for munsterkids. Along the similar lines if you have a girl who isn’t into pink or frills then Munster’s girls line ‘Missie Munster’ is perfect for her. Think harem pants, t-shirt dresses and tee’s with fun and bright prints. And with sizes (from 6 months) up to 14 years this label also helps combat that problem of finding age appropriate-yet still cool- clothing for the older girls. 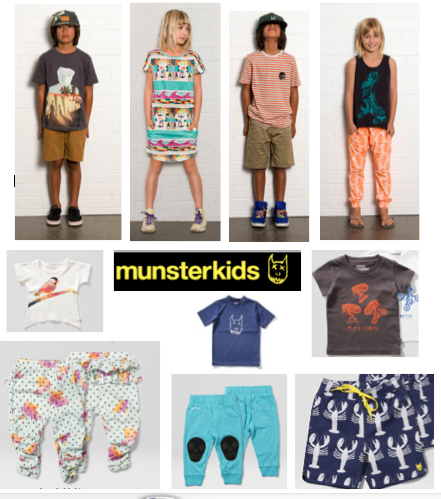 Check out a small selection of Munster Kids below! Photos are sourced from their site. 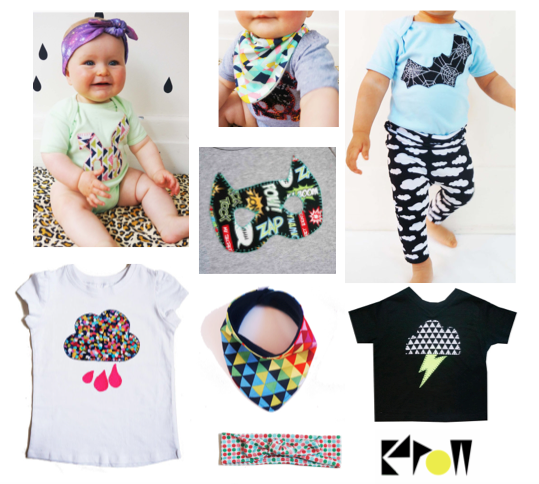 KaPow is a fairly new label, made in Melbourne by Andrea who sews everything herself and even hand stitches the prints on the onesies and tees! (hand stitches!!! I can’t get over that! ) I love the individuality of a small handmade label, and the colours and prints of KaPow Kids is so fun and bright- they would make the perfect funky baby shower gift! Clothing and gift ideas for boys and even the surprise baby (unisex) are done well, with plenty of colourful yet neutral tees and onesies as well as bandana bibs in the funkiest fabrics. The designs are kept fun and colourful while still being simple which is perfect for little ones. A hot tip would be to get on the baby girl headband bandwagon before it takes off in Oz! KaPow do a great range of fabric headbands and I can tell you that there are similar styles sold in America that sell out in minutes so get ahead of that trend! You can visit KaPow Kids online here and Facebook here . Keep an eye out for stockists and markets that may feature KaPow as this cool little label grows!! Check out a small selection of KaPow Kids below- of course more on their site! Photos all sourced from their site.